Although the prices are competitive and the selection unparalleled, Scuba’s World’s best asset has always been its staff, all of whom are knowledgeable and friendly divers and spearfishermen dedicated to helping divers and spearfisherman regardless of experience level. This is the Scuba’s World difference. 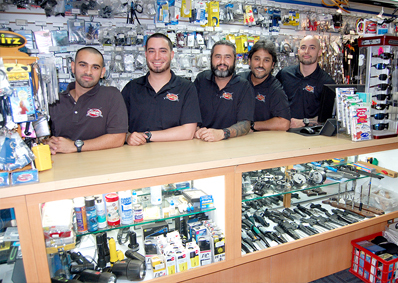 Whether you are a local looking for a dive shop that can meet all your needs or an out-of-town visitor intent on exploring South Florida’s renowned underwater world, Scuba’s World is the friendliest, most professional shop you will find in the area. 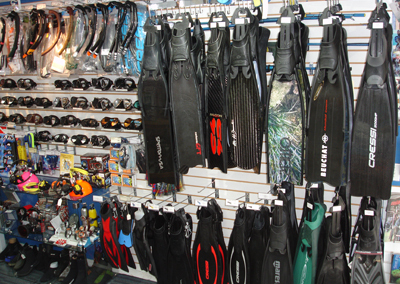 With a full range of snorkeling, SCUBA and spearfishing equipment in stock for sale and rental, not to mention an on-site classroom and Olympic-sized pool only minutes away, Scuba’s World is the most complete dive center in South Florida for everyone from the beginning to the expert diver. 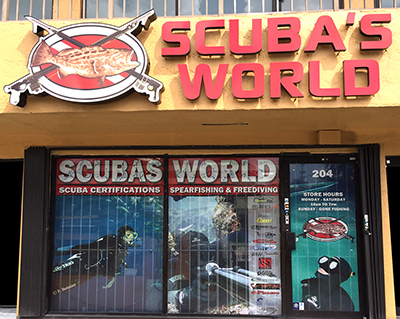 Come see for yourself—browse the shop, take a class or dive with Scuba’s World professional instructors today. Don’t live in South Florida? Through an easy-to-navigate website, anyone can experience the Scuba’s World difference from the comfort of his or her home. Whether looking to buy the latest spearfishing gear or simply searching for information on local weather, fish identification, industry news, or even fun trivia, it’s all here on the Scuba’s World site. Welcome to the Scuba’s World’s difference.